In the interest of time, I'm going to combine the rest of my fall brews into one post. If it's not obvious, this is because the rest of the fall stuff I sampled wasn't that great. Here we go. As you can tell by the alcohol content, this Oktoberfest packs a stronger punch than most. It's darker, creamier and frankly, more difficult to chug. I hate to be redundant, but honestly, how can all these beers claim to be in the Oktoberfest/Marzen category? They are so unalike. I'm not talking about subtle differences between pale ales here, the differences in these beers are vast, and could make someone regret buying a 12-pack because of confusion. Yes, they call this an Oktoberfest. 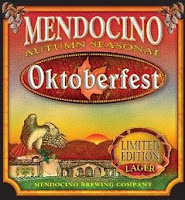 If you were to pick a season for this beer, I guess you could pick fall (the Winter Ale comes out a few weeks later), but I'd call it something other than Oktoberfest. OK, maybe I'm bitter because Summit denied me a job. But I do like this beer in general. I just think the categorizing is a bit of a stretch. In my notes, the only meaningful descriptive word I had for this one was spicy. Next. A traditional Marzen. Golden verging on amber in color, with flavor characteristics similar to a German pilsner. Has a bigger kick, though only noticeable after a couple. I have to admit, I had this one after the Summit, which I thought was a more traditional Oktoberfest at the time, and was slightly disappointed with the result. 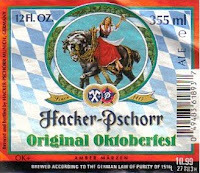 Looking back, I probably slighted Hacker Pschorr a bit. You can't question the original, can you? Reliable sources pegged this one as a Surly clone. I didn't taste the same beer apparently. Though I wouldn't have IDed it as an ESB (I don't like many other than Fuller's), I certainly wouldn't have mistaken it for a Surly. Has good round flavor, with floral hops and a nice dry finish, but is far less aggressive than I need a beer to be. I enjoyed it, and could probably have half a dozen in a night's work, but I'm past the days of pursuing quantity over quality. An attempt at a traditional Oktoberfest. I would like to give Leinie's the benefit of the doubt on this one--maybe it was a bad keg--but I just can't do it. This was garbage. Flat, no zip, no flavor, a leave-it-on-the-side-of-the-road beer all around. Not sure why they even bother. Gets the nod over Leinie's simply because you're getting 1% higher alcohol content. Otherwise, there's just as little reason to touch this. From the notes (pre-Leinie's): "Worst Oktoberfest I've had this year. Flat taste and very bitter." Maybe I'm just not a fan of the style. No no no. Spread out over many days. My tasting experience was legit.